Fairytales are just that—tales. And we all know this, of course. I steer clear of them most of the time, primarily due to their problematic presentation of gender roles and concerning lack of realism, which I don’t think are the very best lessons to teach young children nor great concepts to drill into our own adult minds. I am very passionate about the reality that life is difficult, and when we act as though that’s not the case, we all feel let down, e.g., our constant pondering of why everyone else’s lives look so much better on Instagram. Don’t get me wrong, I think life is great! But it’s also really really hard. And happy endings aren’t really a thing—there’s no ending until the actual end, and while that can be a peaceful, happiness-adjacent thing, it doesn’t quite match the endings of our favorite fairytales and romantic comedies. Those endings are more often beginnings, introductions to the next chapter, which will surely be full of conflict and confusion and money problems and insomnia and, you know, life. I’m not proposing we tell the children that their experience in the world is going straight downhill from where they’re sitting, because it really does get more interesting. But I do think we ought to be careful. However, least I over-intellectualize this, let me get to the point here. When I dip my toes back into fairytale land, I, too, am swept away. So much hope! So much magic! We recently watched the new Cinderella film, and I was utterly charmed. Lily James’ Ella is strong and intelligent enough that I refrained from any gendered analysis, likely to Ben’s great surprise. That night, I pulled my well-worn copy of Ella Enchanted off the shelf in our bedroom. The book (which is much, much better than the movie that’s based on it) is my favorite Cinderella retelling, with a tough, curious female lead and lots of whimsical elaboration on the old, well-known story. I read it in 24 hours. I am now doubly charmed. I am also reminded of what a great idea it is to read young adult literature. I understood every single reference and feel like the fastest reader alive. My other current obsession in the land of fiction is Gilmore Girls, which I’m re-watching on Netflix. I recognize that it’s light and kind of silly and the speed at which they speak is totally unrealistic. But their little town is just SO DANG CHARMING, and it’s all about a mother-daughter relationship and growing up, two subjects that make me extremely sentimental, which is enough to cheer me up on any given day and also to eliminate completely my inclination to critique. This obsession began in earnest around the time I got let go from my job at Good Eggs and fell down the rabbit hole of trying to figure out what to do with my life. No big surprise here, right? We want to escape to something simpler and to the world of happy endings when our own lives feel confusing and complicated. And I think that, at least sometimes, it is absolutely okay to give in. Despite loving big cities, I have lately been longing for the simplicity (and cleanliness) of a small town, where you know everyone and easily stop by the store when you’re out of milk and have just a handful of close friends, but they’re all really awesome and you see them constantly, and you can walk wherever you need to go. I wish for a world that doesn’t need or want the thousands of apps that are being made here in the Bay Area, the ones that try to recreate this sort of simple life but in doing so bring about their own set of problems. Though that’s a subject for another day. While my life generally doesn’t feel as simple as I’d like, I’m grateful for the small communities I have within this big city, like the neighbors I know and our church and the people I met through working at Good Eggs and the new community I’ve fallen into at Ordinaire. And I’m grateful for the shining memories of my childhood, set in a smallish town, when things really did feel simple. This recipe is tied to one of those childhood memories. My mother made wonderful thumbprint cookies every Easter, little nutty shortbreads filled with pastel-colored frosting. I loved them. I still love them. I really need to make sure I bake some this next spring; it’s an oversight of past years that I ought to correct. While these old favorites are filled with frosting, others are filled with jam, and I’d always thought it would be fun to swap out jam for fresh figs, which are, well, jammy. A favorite snack (and breakfast) of mine these past couple of months has been an apple, a fig or two and a big spoonful of almond butter. I figured all of that would make an excellent cookie, and a healthy one at that. It’s a very small happy ending, this one, but charming nonetheless. Preheat the oven to 350 degrees. Line two baking sheets with parchment. With a hand mixer or in a stand mixer, mix the almond butter and sugar until combined. Add the egg and mix again. Add the baking soda and salt and stir with a spatula to combine. At this point, you can chill the mixture for 30 minutes, advisable especially if the dough is not firm, which depends quite a bit on the consistency of your almond butter. Roll the dough into walnut-sized balls (about 1 heaped tablespoon each). Press them down slightly, making a shallow indent with your thumb or the back of a tablespoon. 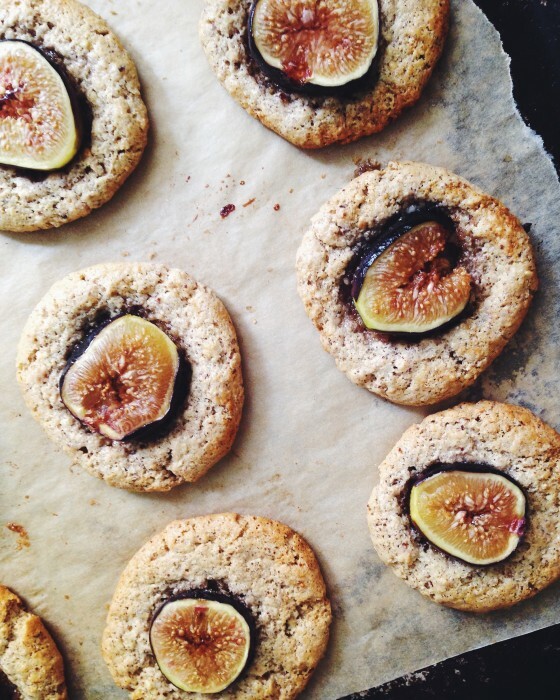 Set a halved fig atop each cookie. It looks a little silly, but the cookies will spread, letting the figs sink down into the dough. 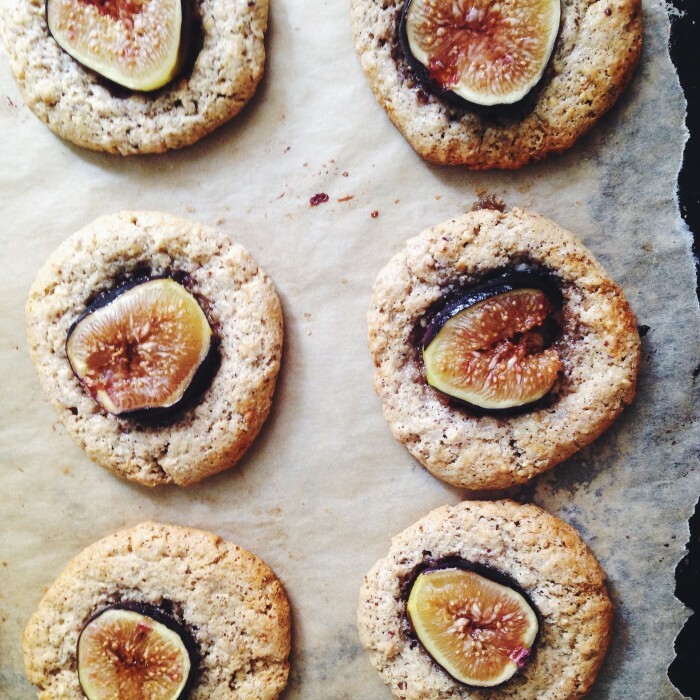 Bake the cookies for about 10 minutes, until the cookies are lightly browned and the figs jammy. These cookies are best the day they are baked but will keep for a day on the countertop in a well-sealed container or for several days if refrigerated. my friend. just catching up on all your lovely posts (such magic you’ve been making in the kitchen) and sorry to hear of the job stuff. I hate that whole “one door closes, another opens” bs but it is frustratingly true most times. I hope that for you. My mother in law has been begging me to watch Gilmore Girls and I may just cave because of your recommendation :) Hugs to you, miss! Ahh, I love Ella Enchanted. I have a super old dog eared copy of it at home. Such a lovely retelling of Cinderella! I’m so happy to find another fan with an old copy of this sweet book!! Love the Gilmore Girls reruns, too. Did you ever notice how often when there is an outdoor shot, the streets are wet? It makes te show up better! I think I still have your Grandma Levitt’s recipe for the *original* family recipe for thumbprint cookies. She made them often for family gatherings. Nice memory. I love that you appreciate Gilmore Girls, too! And to have it confirmed once again that we love so many of the same family recipes. Such a nice California twist on an old family favorite cookie. Too bad figs are so hard to find in Michigan!